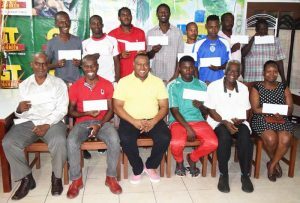 Representatives of the teams that are participating in this year’s Limacol Round Robin / Knockout Football Tournament pose with their cheques and Petra Co-Director Troy Mendonca (third left) on Wednesday. that was conducted, at the Bransville Hotel on Pike Street in Campbellville. In addition to teams representatives, also in attendance were officials of the Petra Organisation, the entity that has responsibility for the entire organisation of the tournament. Co-Director Troy Mendonca speaking at the occasion spoke of how pleased they are with the support that is being received by the teams, while also showering praise on all the sponsors who’ve added their support to the event. ”I would like to assure all the sponsors who’re on board that the support you’ve given is money well spent and we in the Petra Organisation are optimistic that the tournament is here to stay. The winner of each group received $100,000, while the 2nd, 3rd and 4th placed finishers were given $50,000, $30,000 and $20,000 each. Meanwhile, a double header will be played on Sunday, at two venues. At the MSC ground, Milerock play host to Western Tigers, while Winners Connection takes on compatriot Eagles United. 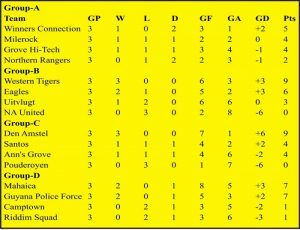 At Victoria Ground, Police square off against Den Amstel, while Mahaica Determinators entertains Santos.